Pangrupukan, Balinese New Year eve is always full with celebration and festivity, and ogoh-ogoh, the monstrous doll of Bhuta kala, evil spirit or the personification of negative force, is an indispensable part of this festival. The ogoh-ogoh is truly monstrous in size and appearance. The inspiration for creating this monster is usually drawn from the Ramayana epic, the tale of Calonarang, and other Balinese folktales. The ogoh-ogoh must be in a form of Asuri Sampad or scary monster, giant, witch and other kinds of monster. 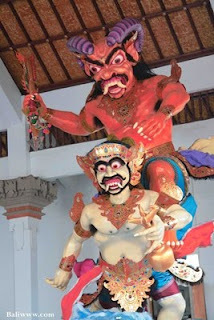 Every banjar (hamlet) in Bali makes at least one ogoh-ogoh, larger banjar usually make two or three ogoh-ogoh. Creating this monster is a male prerogative especially the youth, no adult male member of the banjar participate in making this horrible monster except he is asked by the youth member of the banjar. Children usually make a smaller ogoh-ogoh, of course with the help and advice from their elder brothers. The activity of creating ogoh-ogoh is usually started a month prior to the pangrupukan, Balinese New Year Eve. Late in the afternoon, the bale banjar (hamlet meeting hall) will be filled with a dozen of boys creating the body and other parts of this monster. They usually work until late at night especially when the pangrupukan is close ahead. Sometimes, especially in the Saturday night only two or three boys left to work on this monster. But as the pengrupukan slowly approaching the number of workers will steadily rise, but only three or four of them who worked seriously, other boys are usually busy giving advices or watching the progress of the work. The framework of ogoh-ogoh is normally made from wood but for a bigger ogoh-ogoh a steel frame is usually used. Thousands of bamboo strips are intricately weaved to form the body which is then covered with paper. The face of ogoh-ogoh is usually made from sponge, stereo foam, or wood. A great mastery of sculpture technique is needed in making an excellent face for this monster, but from all the processes of making this monster, the paint job is the most difficult part of it. A perfect combination of color is needed to give a dreadful impression to this monster. When the ogoh-ogoh is finished a prascita offering is given to it to purify this monster. Two or three thorny pandanus leaves is attached to the body of ogoh-ogoh in order to prevent the evil spirit to reside and take control of this monster.